"... I am thrilled with you and your teams ability to resolve issues...Huge thank you to your Team..."
Richard & Rice Construction Co. Inc. "...Your team stayed to get our system up and running...we came into the office in the morning after losing our server motherboard and it was like nothing had ever happened to our system..."
By now you’ve heard the word virtualization, but do you know the full potential of virtual servers? More than just software on a server, virtualization is a technology that can transfer your entire IT infrastructure. Virtualization is best known for the ability to turn one physical server into multiple virtual servers. Yes, one of the advantages is that it stores more data. That’s just one advantage. A physical server uses about 20% of its capacity A virtual machine can handle up to 12 times as much processing. Virtualization can drastically change your IT environment and your IT budget. Rooms previously filled with servers can contain some expensive square footage that can be re-purposed. Taking servers out of a room not only frees up space, it also means a reduction in cooling costs. Hot temperatures in Southern Florida means that server rooms need a lot of cooling. Think about this cost factor the next time you look at your energy bill. It isn’t just the cooling costs that are a factor. By reducing your physical server footprint you’re also reducing your energy usage. Virtualizing your server environment can reduce your electric bills drastically. This isn’t just an immediate savings, it’s a savings over the lifetime of the server. Another benefit is that in a virtualized environment you have less physical servers to manage. This frees up the time of your IT team and helps you control the man-hours spent servicing your infrastructure. When the need does arise where you need to bring on another server then virtual machines allow you to scale up with relative ease without making an investment in new hardware. Virtual machines are not only scalable but they’re also reliable. Today’s modern virtualized servers also have a longer lifespan. One other big advantage of virtualization that is often overlooked is the benefits it brings to data backup and disaster recovery. When done right, a virtualized environment makes back up and DR easier than ever. Consolidation allows for more affordability in the backup and DR process. Do yourself a favor and build out a DR plan if you haven’t already. Virtualization helps with many aspects of backing up and restoring critical data. Virtualization allows for faster Recovery time objectives, or disaster failovers. It also makes it easier for you to test your company’s preparedness before the next disaster strikes. Virtualized environments offer too many advantages for you to not consider it for your IT environment. Call Comprehensive Business Systems experts to realize your servers’ potential today. 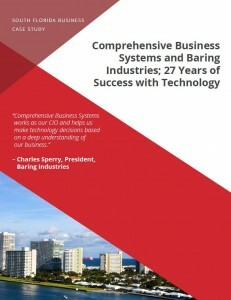 To read more about how we help South Florida businesses with IT challenges like server virtualization, download our Case Study about our 27 year relationship with Baring Industries of Fort Lauderdale. For those you still uncomfortable with virtualization, let us provide some clarity. You should be asking how you can afford not to virtualize? Server Virtualization isn’t just about the consolidation of servers, it is also one of the best disaster recovery and data backup tools out there. Imagine a IT environment filled with virtual servers, that has a physical server crash. This makes it easy to restore the virtual servers that resided on the crashed that machine to another virtual host. With the right DR and data backup plan in place virtual servers can actually recover faster than physical servers. A virtual server allows for a faster restore time and better management due to the efficient software. The bottom line is that with proper disaster recovery and data backup plans in place you can recover faster with a virtual machine. Nothing says that you must be backing up large amounts of data before you can virtualization. 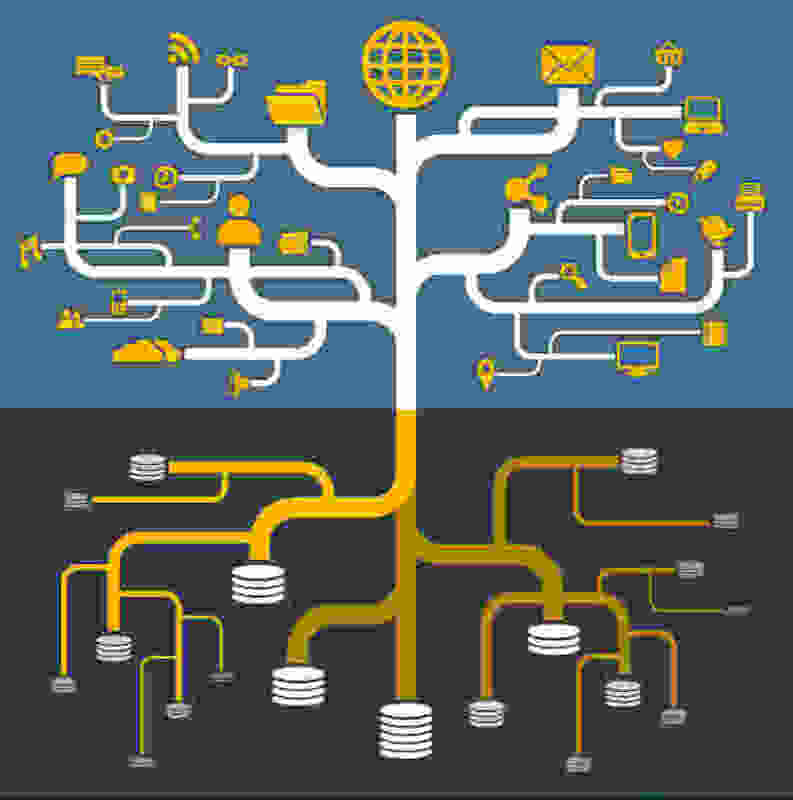 Your company may be experiencing data growth that requires you to implement virtual servers. Companies of all sizes look for where they can save costs on storage, hardware, and software purchases. Virtualization could be the answer for any company using 2 servers of more. Virtualization is the future. Servers, like the IBM/Lenovo System X Series, are designed to be virtualized. Check your IT budgets and plan to add virtualization. Or better yet call Comprehensive Business Systems’ at 954-434-5355 to talk about how virtualization could work for your organization. In today’s business world IT success and business success are closely linked. 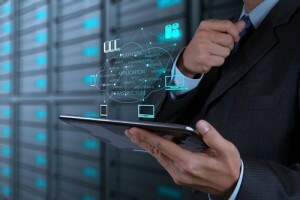 Companies need servers, computers and networks that can keep pace with the vast amount of business data that flies around the office on a daily basis. The performance and speed of your IT environment is important. You are at a disadvantage versus your competition when you’re working with technology that barely meets your basic needs. You need a well-planned IT strategy now more than ever. What happens if you continue with your older hardware? Your business will slow down and over time you’ll experience more and more downtime. A study done by Aberdeen Group in 2012 found that organizations with less than 100 employees lose an average of $6,900 for every hour of downtime they experience, and mid-sized businesses of less than 1000 employees lose around $74,000 an hour. Factored in here is not just salaries of employees, but also the potential loss of business. It’s difficult to calculate the exact costs, but no business owner wants to see their systems go down and their staff unable to perform some of their core tasks. By not being proactive about your aging IT you’re creating a potential liability for your organization. The last thing you want is for parts of your infrastructure to fail slowly over time. This leads to a patchwork of old and new devices, temporary fixes, and even system incompatibilities. These temporary fixes may be easy to swallow in tiny bites but they add up. Start making your IT costs predictable with proactive planning. Stop being reactionary and only confronting problems with something goes wrong. When our team of IT advisors sit down with an organization we aim to not only get an understanding of their IT environment, but the goals of their business. When you start looking for help building a proactive IT plan, make sure you’re not just sitting down with someone looking to sell you a load of equipment. Find a company that’s working to align your IT plans with your business goals. At Comprehensive Business Systems, we believe in working together to come up with a solution that will fit our clients’ needs and budgets. Our strategy workshops provide a powerful framework for analyzing your business to determine where technology can help increase your bottom line. We are your partners throughout the entire IT process, and we consider it our responsibility to help companies navigate the IT waters. We focus on IT so that you can focus on your business. Discover how we can help you company today – we look forward to hearing from you. Feel free to email us at info@cbsbiz.com, or call us at 954-434-5355 x710! To learn more about our partnership with Baring Industries of Fort Lauderdale, click our case study below. 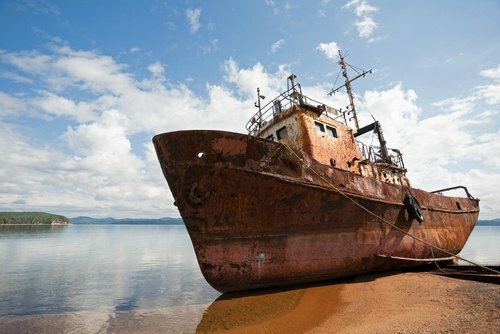 As many of our South Florida, customers know, when a boat gets old and rusty, it stops running as efficiently as before. If things get bad enough you might find yourself bailing water out and paddling. If you even make it back to dry dock you have to repair parts, make patches, and expend a lot of time and energy to try to get the boat back out on the water. The same idea goes for IT infrastructures. As it ages, functionality decreases as the costs of maintenance and repair increases. Success in today’s marketplace requires cost-effective, efficient, and dependable IT infrastructures. 1. Enhancing functionality – Newer infrastructures feature interoperability. 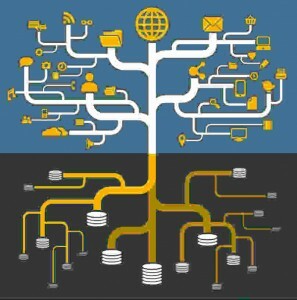 Rather than navigating between inflexible storage systems, scalable infrastructure provides IT professionals with more control over their systems. Stress is taken off of IT teams and inefficiencies are extinguished. In addition, businesses can choose to outsource maintenance and monitoring to a skilled Managed Services Provider, which gives IT Managers more time to spend on business-critical tasks. 2. Built-in Features – Previous generations of hardware and software lack the features and add-ons of today’s servers. Newer servers use virtualized platforms and pre-installed cloud engines for more agile environments than the servers of even a few years ago. As a result of these agile environments companies can accelerate business functions and production. 3. Downtime reduction – When downtime occurs companies bleed money. 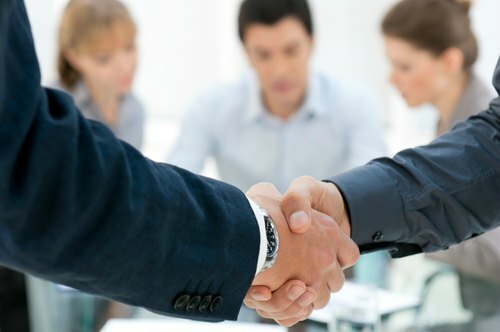 Time and reputation with clients can also be drained, leading to setbacks in profits and production. Updated and healthy infrastructures can give you a competitive advantage. Don’t let your old IT infrastructure monster hold your company back from achieving and surpassing your business goals. Contact our Davie, Florida location or call us at 954-434-5355 to find out more about how we can help. 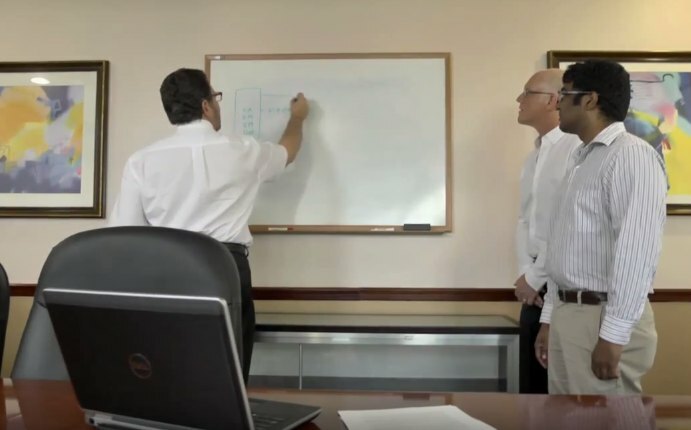 Many South Florida small and medium sized businesses find themselves at a disadvantage when it comes to having a security strategy. SMBs can’t afford to pay someone to solely handle IT security concerns. Achieving a comprehensive security strategy involves incorporating multiple layers of protection. Re-set passwords. Sounds simple right? But this topic causes more complaints from end-users than anything, Resetting passwords regularly can be a first line of defense that keeps unwanted programs and people from accessing company data. If you’re able make sure to set rules to ensure your team sets strong passwords so they avoid passwords like “password” or “123456.” Check out a list of the worst passwords from 2014. If you don’t set proper protocols your end users could be using some of these! Update anti-virus and firewall software. Updates are too often ignored and pushed aside. Your IT network will not be protected from the latest threats unless you make these basic updates. This is a critical line of defense between your company’s network and the new malicious threats that pop up on the internet every day. Access points. An important part of securing any network is securing your access points. Avoid internal and external data breaches by limiting user accessibility to your most sensitive data. Make sure every piece of equipment has access point controls set. Maintenance and system-wide clean-outs. How long has it been since your company underwent a system-wide clean-out? You should try to perform this activity every month. Get rid of replaced hardware, clear out old user accounts, and find any other non-essential or undesirable information and clean it out. Data Backup and disaster recovery. Mother Nature plays a role in destroying critical business data from time-to-time. Back up your data. When the next flood, fire, or hurricane strikes you’ll be ready if you have Backup and disaster plans in place to safeguard your data. This is like your insurance policy for your data. Building and budgeted for a formal plan might be cumbersome, but it’s going to be far less of a burden than trying to recover the health and profit of your business after a major data loss. Security is an on-going process. Password changes, security checks, regular maintenance are a necessity for any modern business. Just because you’re a small business doesn’t mean that you shouldn’t put the safeguards in place that large businesses have. There are some simple ways to secure your network and protect your data if you take the time to understand where you’re vulnerable and take appropriate action. Comprehensive Business Systems offers Security auditing and risk assessments. We help businesses detect problems that your company never knew existed. For a complimentary Comprehensive IT Analysis contact us and find out how we help other South Florida organizations save time and money. One minute of downtime causes businesses $5,600 on average*. In order for your company to maintain efficiency and profitability you need to have a reliable network and infrastructure. Everything from your website to your communications systems to your business-critical software relies on the stability of your systems. 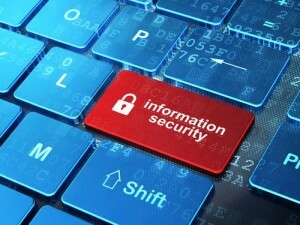 Information security is another important aspect of this stability that can’t be overlooked. IT costs can be unpredictable. Is your organization taking a proactive approach to data center and network health? This an enormous responsibility, but many companies are only performing fixes when something finally breaks. Does the service provide the level of customization your company needs? Your organization is unique and the level of help you need for network monitoring and maintenance is going to be unique as well. If your service provider isn’t interested in learning about your company you’re your business goals before they offer you a plan and pricing then they’re doing you a disservice. Your Service provider should be interested in learning about your company before offering any pricing. Does the provider provide the flexibility you need? – What aspects of your network do you need help with and which can you cover yourself? If you’re only being offered all-or-nothing options then you should walk away. How knowledgeable is the service provider on different parts of the network? – Networks are complex, from switching and routing to backup, virus protection and security there are a bevy of skills required to provide world class service. Make sure the provider has the knowledge and proper certifications to make sure that your system will be covered by someone who know networks A-Z. Are Health Checks and Annual Reviews Included? – As your network and your company changes through time, you’ll need a service provider who is checking in from time-to-time. Environmental elements, like temperature and humidity should be part of any good check-up., Battery health, service logs, virus and spam filters, backup systems, and disk space and memory usage should also be looked it. Because your business needs may shift from year-to-year, your service provider should be working with you to build a proactive IT strategy that can shift as your business and budgetary needs shift. Are you getting a paper trail record of what the provider is providing you? Find out what level of reporting you’ll be provided by you network provider. They should be able to produce information that dives into your network performance. If you have specific requirements for the reporting they should be able to customize this to your needs. Find out if they can provide weekly/monthly/quarterly/yearly or even on-demand reports that meet your specifications. Contact our experts today and request 3 months of free Server Health Monitoring services or to learn more tips download our whitepaper Top 10 Money Saving Secrets Your IT person Won’t Tell You. Have you evaluated your Managed Service Provider (MSP) lately to determine their value and effectiveness? Do yourself a favor and take a look at your contract. It is important to keep your MSP honest and for you to have an understanding of the services you’re getting from them versus their competition. Do an evaluation at least once a year. Go beyond the prices and service levels. When you make your yearly evaluation consider these factors: efficiency, value, and future development. Your success as a business is tied to your MSP. Make sure you’re working with an organization that you can rely on. The future growth of your business could be at stake. Here’s a checklist of things to consider when choosing the right MSP for your South Florida business. Map out a Plan for Technology Success and Business Success – Your MSP should help make your business more productive. The best MSPs aren’t trying to sell you more than you need. They should be right fitting solutions that are customized for your company’s needs and your long term growth. Good MSPs work with you to understand your business priorities and your budgets. Make sure that your MSP is able to provide you with progress reporting and budget summaries. You should be able to check their work and they should be proactively providing insight into their work with you. Make sure that your MSP builds this planning and reporting process out from the beginning of the relationship. Make a Business Case – What kind of value is the MSP going to provide your business? They should be as interested in growing your bottom line as they are growing theirs. You want to find a company that understands you and your business goals. You want a company who is looking to build a long term relationship that directly ties into your company’s overall success. You should be able to see the value that a MSP is providing your business. They should be able to relate to you the new operational efficiencies that you’ll see through their work. Don’t accept anything less. Develop Shared Trust and Extend Technology Relationships. Great MSP’s are part of larger IT communities with other companies and IT partners. Make sure that you’re working with an organization that is tied in to the IT world. If they won’t be able to make you aware when new products, services, or innovations come out that could help your business. Your MSP should be top-notch IT experts who are tapped into the world of business technology. Does your managed service provider understand your company’s business goals? Are they working just to sell you equipment and bill hours or are they looking to build a long term relationship? We at Comprehensive Business Systems know how IT drives business. 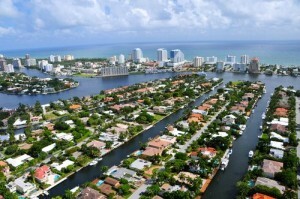 Read our case study about our 27 year relationship with Baring Industries of Ft. Lauderdale. A business that cares. To many, companies are faceless corporate entities focused only on the bottom line. In these narratives, it’s never about the customer or really even about the product or service. It’s about making a buck, usually at the expense of a transactional customer. But there are companies out there that base what they do on providing quality service and delivering what’s best for their clients. Comprehensive Business Systems is one of those companies. We know that IT is a specialty expertise and that even when organizations have in-house IT people that they lean on companies like us to stay informed on what kinds of technology solutions are available in the marketplace to enhance their businesses. Becoming ingrained in a company’s technology direction is more than just knowing the technology. It’s about knowing the business and building relationships. A perfect example would be our relationship with Baring Industries. For over 27 years, our integral relationship has thrived through a variety of IT services, most recently through managed services support. 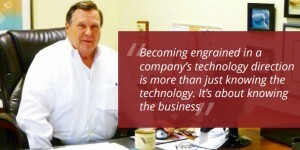 Baring, a once small, on-premise laundry company, found its beginnings in 1961. They’re now a $70 million a year business that builds kitchens and laundries. Their relationship with CBS started in 1988. Since that time, we have helped Baring compute, connect, and collaborate in ways that were almost unimaginable in the 1960s. We are as committed as ever to being a strategic partner of Baring by making proactive recommendations on new technologies that will make their business more efficient and economical. As technology has changed, so has Baring, but never in way that wasn’t in line with their business goals. From virtualization and disaster recovery, to private cloud, mobility, and security, CBS has been an integral part of Baring’s growth. Since 2011, CBS has completely managed the IT services of Baring. This includes helping with software and server upgrades, networking upgrades, email systems, and even technical Baring’s website. To read the entire story download our Baring Industries case study. Does your South Florida Business see disaster recovery and data backup technologies as a necessary part of your IT plans or are they seen as an afterthought? 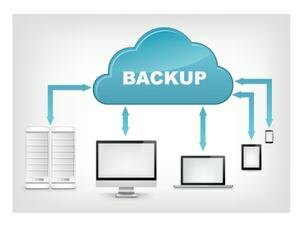 Without proper DR and backup plans your company is at risk. DR and backup are critical to maintaining operational stability when disaster strikes. Don’t view these plans as a nice to have insurance policy. Without the right backup strategy you could end up seeing inefficiency and extra costs should a worst-case-scenario happen. A mix of cloud technologies and an on-site data storage solutions can bring peace of mind to your organization. Datacenters can be extended without significant upfront costs by utilizing new cloud computing technologies. These types of solutions were once only available to enterprise-grade businesses, but over the last few years many companies in the SMB space have been able to make investments in the cloud. The economics of cloud computing allow small and medium businesses the luxury of avoiding high upfront infrastructure costs. Instead of worrying if they’re choosing the right size servers for their growth, cloud computing allows companies the room to scale up when they need to. Pay-per-use models give companies the benefit of lower total cost of ownership—they aren’t paying for what they aren’t using. Many cloud models also come with more predictable monthly operating costs. Cloud based solutions also allow you to keep your existing infrastructure. Many cloud based solutions are designed to integrate into existing infrastructures. Management and monitoring of your IT systems takes less dedicated time and can even be outsourced to managed service providers. Backup maintenance becomes simpler and IT staff’s time is freed up to dedicate to other more business critical tasks. Companies looking for data protection both on and off site should consider a hybrid cloud model. In this situation, if your internal cloud fails, then your team still is able to access data through a secure external cloud. Hybrid cloud backup gives you cost-effective benefits and can increase your IT infrastructure performance. Find out more about what a hybrid cloud backup strategy can offer. Reach out to our experts at Comprehensive Business Systems. Our years of server and storage experience combined with our expertise with cloud technology can help you build a cloud backup strategy that perfectly fits the needs of your business. 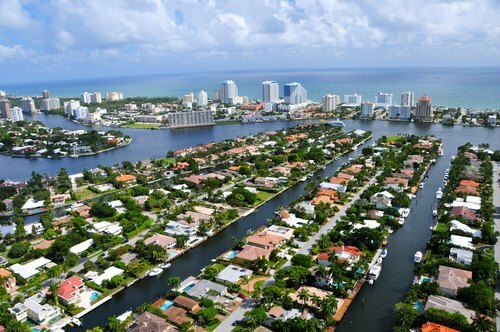 Find out how we helped American Recovery Specialists of Deerfield, Beach Florida back up and protect their data. 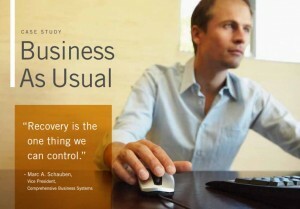 Read our backup and recovery case study. Modern businesses need IT security policies in place to help manage their data and prevent data loss. Even small businesses are at risk if they aren’t addressing IT security concerns. Hackers, hacktivists, thieves, and disgruntled employees are out there. They are stealing identities, revealing business secrets, taking financial data and even holding your data ransom with nefarious sounding viruses like cryptolocker. They are out there and they are waiting for a chance to pounce. Firewall Protection. Firewalls are the filter for all of the data coming in and out of your network. Make sure that they are configured to recognize and report possible data breaches. If you experience a network intrusion these systems should be set up to send out an alert. If people can remotely access your system then a firewall is a requirement. Make sure that you have a system in place that not only gives you real-time alerts, but that also sends you regular reporting on that state of your firewall security. Data Classification and Handling Standards. What is your most sensitive data? What is lower in priority in terms of sensitivity? Any data that you are required by law to protect—like credit card information, patient data, or HR records, must be made a very high priority. With the right classification hierarchy you can determine which data needs the most protection. Usually organizations will classify their data into public, internal, and private. You may need additional levels depending on the data being handled. Doing a security inventory of your data is a good first step in determining these classifications. Access Controls. Who is able to access your data? Make sure that the people who need access to certain data have access and the people who don’t need access aren’t allowed in. Limiting the number of employees who can access your most sensitive data is a good first step. Make sure that your systems are configured properly so that configuration mistakes don’t lead to gaping holes in your IT security. Once you have proper access controls in place make sure that someone is doing an access audit at regular intervals. Don’t be the victim of the next small business cyber-attack. Be proactive and take the measures necessary to prevent a data breach. If you aren’t sure if you’re properly protected then reach out to us. One of our IT network specialists will work with you to access the security health of your IT environment. Comprehensive Business Systems will identify your system vulnerability by running our managed services client on your server for one month. We'll analyze server, router, firewall, and switch operations to identify opportunities for optimization. Security tests will identify where your system is susceptible to malware and viruses. We'll review backup strategies to discern disaster recovery preparedness. At month's end you'll receive a free report outlining issues and findings; you'll also learn ways for your company to eliminate system downtime.